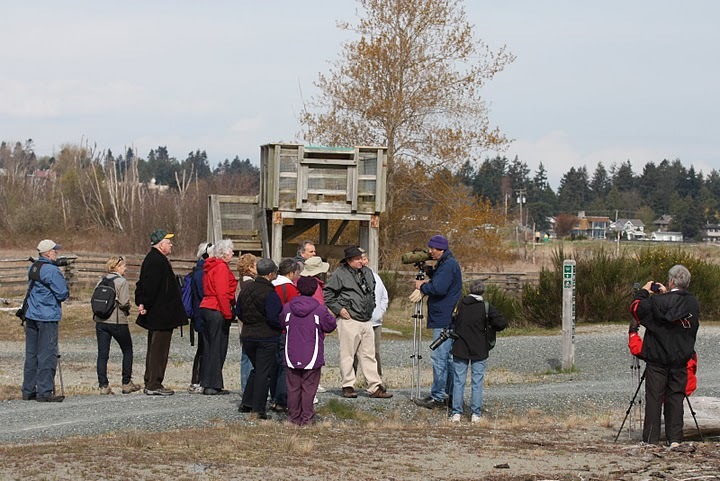 About 20 participants (including several non-Deltans from West Van, Burnaby, etc) enjoyed a beautiful Wednesday morning of birding on Delta Nats Spring “Birds on the Bay” outing in Boundary Bay Regional Park (BBRP). Hi-lites of the 2 ½ hour walk were: lots of Shorebirds up-close-and-personal including Dunlin, Sanderlings, Short-billed Dowitchers, Greater Yellowlegs, Marbled Godwits and Black-bellied Plovers; first Spring sighting of a Common Yellowthroat, many Savannah Sparrows; excellent photo ops for other waterfowl (e.g. Northern Shovelers, Green-winged Teal) in breeding plumage and, most pleasurable was the collection of gourmet snacks and refreshments prepared by the Delta Nats Ladies at Cammidge House to climax our outing. 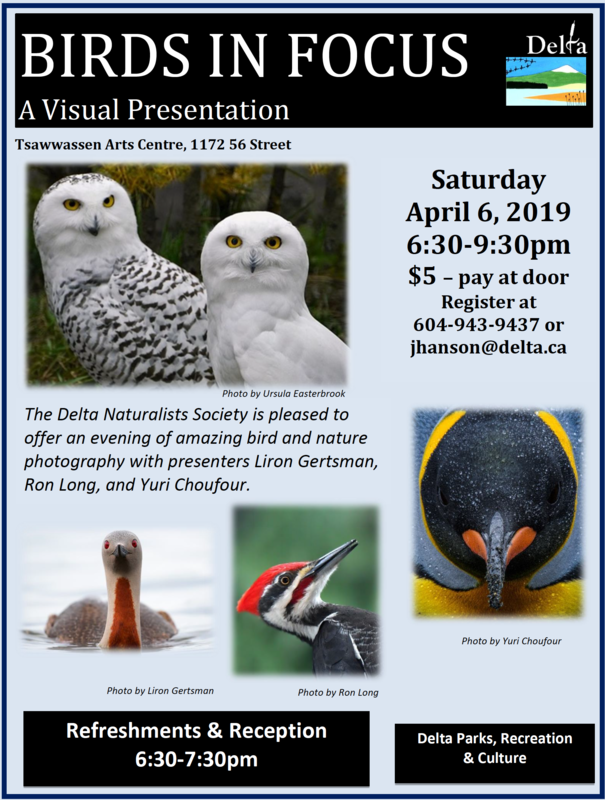 Check out the many neat photos of this outing on our Picasa website at http://picasaweb.google.com/dncbirding. 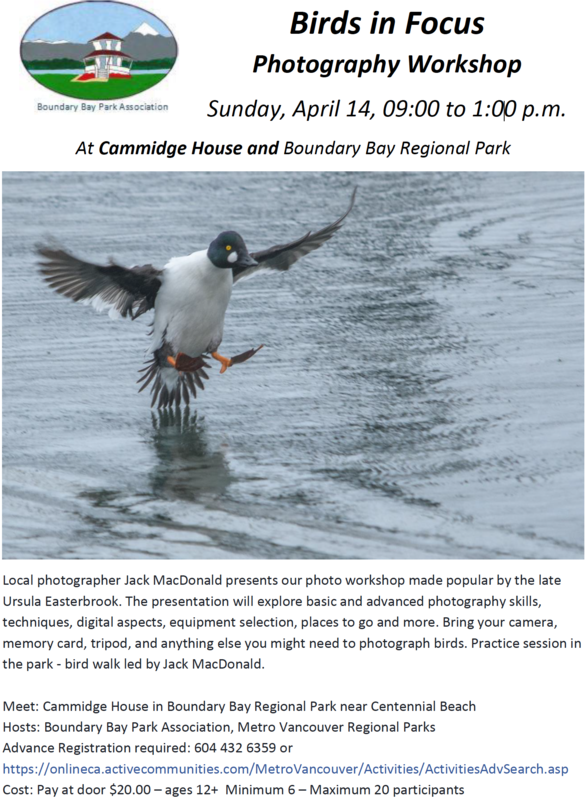 At the Cammidge House start (9:00 a.m.) of our walk, we saw a couple of the several resident Northern Harriers glide by as a V of Canada Geese was flying northward in the sky. Along the road toward Centennial Beach eight Bald Eagles were perched in the trees, not caring a bit about us below. A pair of Gadwall was in the pond by the snack shack while several American Wigeon and Mallards foraged on the grass nearby. At the beach the tide was fairly high and going out. A lone Greater Yellowlegs was close in and two Marbled Godwits were seen further to the south. About 800 (Brant Guru Richard Swanston’s count) Brant Geese were in several flocks along this shore, some close for good viewing. Lots of mixed flocks of breeding and non-breeding plumage Shorebirds, mainly Dunlin and Sanderling, feeding along the shore. We saw groups of Short-billed Dowitchers and Black-bellied Plovers among these flocks as well as a few more Yellowlegs. Ducks were further out, including Northern Pintail, Green-winged Teal and unidentified diving ducks. Many Bald Eagles and Great Blue Herons out there too. In the inner waterways along the path pairs of breeding plumage Northern Shovelers and Green-winged Teal gave us some good photo ops. Unfortunately, we did not see any Mountain Bluebirds which had been there on the weekend. At the pump house, we saw lots of Tree Swallows, a few hanging around a couple of the 30 Nesting Boxes that Delta Nats (led by Don Farquhar and Jim Shirk) have strategically paced throughout BBRP. As we turned onto the inland trail, our Guru Anne spotted a beaut male Common Yellowthroat. On the inland walk back to Cammidge House we saw several Sparrow species including, Savannah, Golden-crowned and Song. Noisy Marsh Wrens were in several marshes. Lorna saw what may have been a Yellow Warbler. Back at Cammidge House while Don was frustratingly trying to take our mandatory Group Photo, a Rufous Hummingbird was flitting in the bushes near Metro Vancouver’s shed. Following a scrumptious delight of home-made goodies (sandwiches, scones, fruits, etc.) 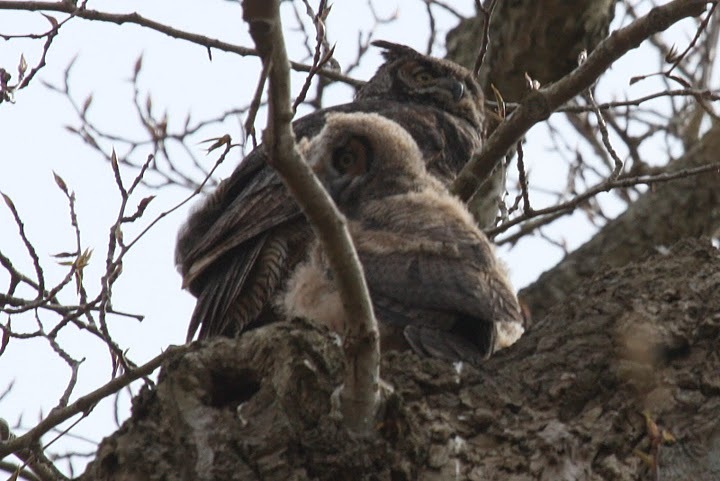 prepared by our Delta Nats Ladies (Jennifer, Mary, Eleanor, Sandra, Rochelle), several us went to Beach Grove Park to see the Great Horned Owl pair and their two Owlets. They posed nicely for us. This topped off a very enjoyable morning of birding. 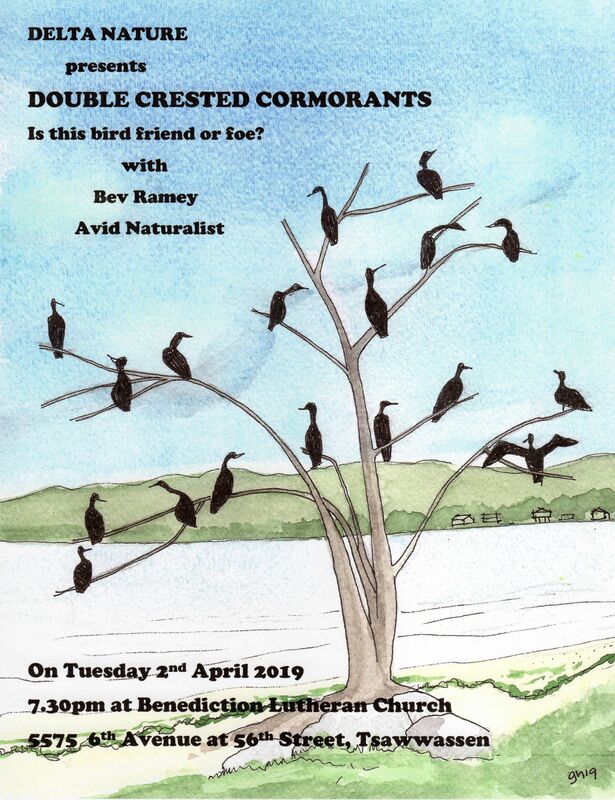 I will be at Petra’s next Wednesday morning (note change from Monday to Wednesday), April 27 around 7:30 a.m. for departure at 8:00 a.m. on a Casual Birding outing “somewhere around the Bay”. Check out our Blog at www.dncb.wordpress.com. Comments welcome, and please advise me again if these missives annoy you. 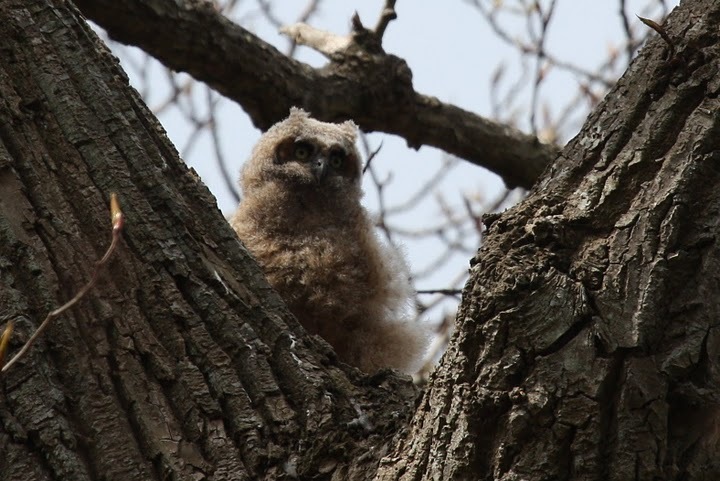 This entry was posted in *DNS, BBRP, Beach Grove, Birds-on-the-Bay, Cammidge House, Great Horned Owl. Bookmark the permalink.